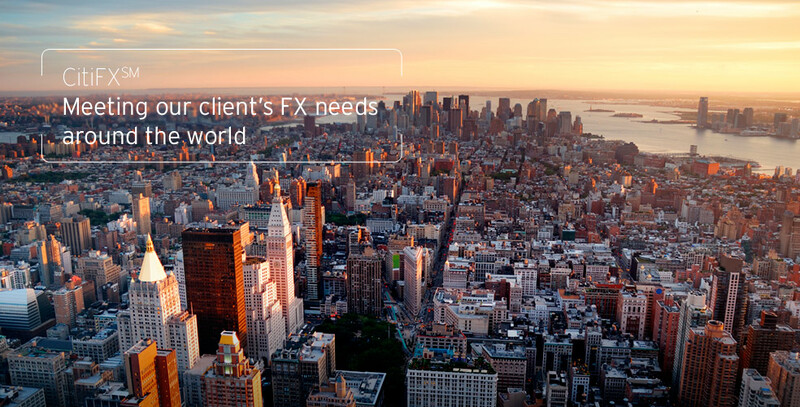 Clients benefit from our unrivalled insight into global FX markets. Our physical presence in 83 countries gives us unrivalled insight into global FX markets. Our clients benefit from this as well as unparalleled liquidity. We trade over 140 different currencies out of our 83 centres. So it's no surprise that CitiFX has the broadest range of clients out of all the major FX banks. Our network is our strength. Our award winning platforms allow the full range of tools for clients. Our award winning platforms allow the full range our clients from major institutions to small- to mid-sized enterprises to improve the performance of their businesses and access the markets 24 hours a day. CitiFX is possibly the best known name in the FX market around the world. To find out more about our best in class electronic platform please contact efxsales@citi.com. Our experienced global team can guide clients to achieve their goals. Our global team, drawn from the countries where we are present, can draw on many years of experience in the FX markets to guide our clients to achieving their goals. The success of our business relies on the skills and motivation of our people. We would like to introduce some of them to you. Our success has been reflected in the awards that we have won. Latest awards and industry recognition for CitiFX.